The, Korg Polysix, information page! 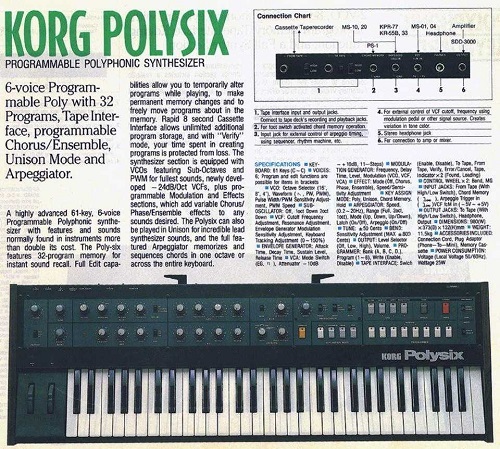 The PolySix was a milestone because, along with the Roland Juno 6 which appeared almost simultaneously, in 1981 the PolySix was the first opportunity ordinary mortals had to get their hands on a proper programmable polysynth. Up until then, you had to be loaded to afford a Prophet 5, Oberheim OB-Xa, or Roland Jupiter 8. At first glance it looks like a scaled-down Mono/Poly, but really it's not! In fact it had a lot of great new features such as 32 memory patches, 6 voices of polyphony, cassette backup of memory, even programmable modulation effects and Chorus, Phase, Ensemble! The Polysix has warm-sounding real analog oscillators, softer and brassy-er sounding than the Juno. Engage the built-in Chorus on a simple single-oscillator sawtooth patch and you were pretty darned close to that expensive Prophet sound. But the big ace in the Polysix's hand was the Ensemble effect. Instant Mellotron-like strings. Like the Mono/Poly the voices can be played in Unison for a 6-oscillator lead sound that was so big, it was often too big! The advanced arpeggiator can memorize and sequence chords across the keyboard. 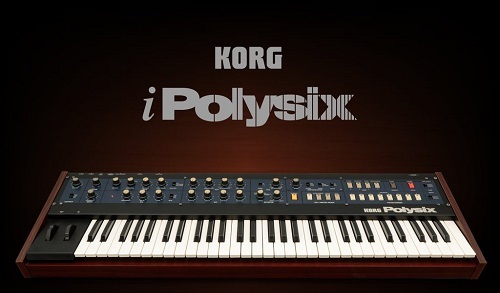 The PolySix has now been recreated in software as part of the Korg Legacy software bundle! The PolySix has been used by Eat Static, Geoff Downes, Astral Projection, Jimi Tenor, Global Communications, Kitaro, Robert Rich, Keith Emerson and Tears for Fears. Do you have content, to add, about the Korg Polysix or associated topics? Please feel free to Share it, here!